I use NBMS for my catheter supplies and words cannot express how satisfied I am. My orders are always filled quickly and the staff is so friendly and efficient. They are so helpful when I have questions and are generous with information. I appreciate New Britain Medical and all they do for me. They definitely have a fan for life! I was a little hesitant leaving my previous medical supplier consisting of 50 plus employees because I was comfortable with them. Now after over 7 years using New Britain Medical Supplies, I have been completely satisfied. I am greeted on a personal basis and all of my physical and personal needs are met promptly. Whether it is a change in medical supplies or insurance, they have helped me get my supplies the next day to my door with no questions asked. I know I can trust New Britain Medical because of Joey’s insights and personal experiences using the products he sells. 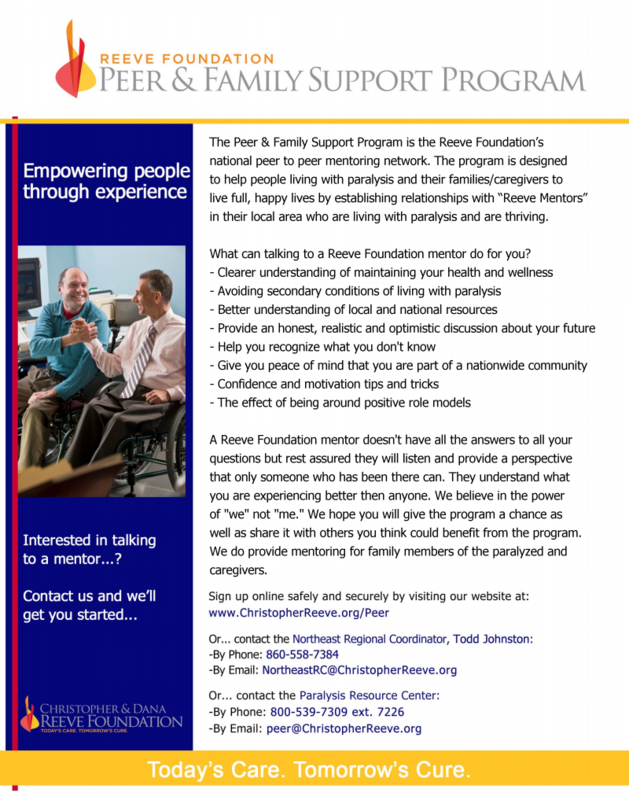 New Britain Medical Supplies is excited to announce our partnership with the Christopher and Dana Reeve Foundation and the start of our Peer Mentoring Program. This program is designed to help people living with paralysis and their families/caregivers to live a fulfilled and happy life by speaking to mentors who can offer emotional support as well as provide local resources. Whether you are newly injured or have been living with paralysis for a period of time, there are always questions that would be better answered by someone who has a similar experience. 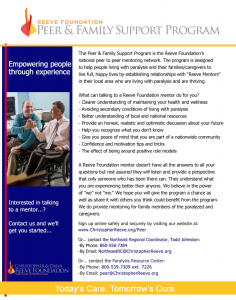 By partnering with the Peer and Family Support Program, New Britain Medical will be offering office hours for those who are interested in the program that wish to speak to a “Reeve Mentor.” We will strive to match people with certified peer mentors who are of similar age, location, gender and level of injury or type of paralyzing injury. Even if it’s simply to offer advice on where to sign up for a sport, how to maintain health and wellness, or to just “chat,” our mentors can provide a myriad of resources and support. For more information about the Peer and Mentorship Program.